People who live within a particular ecosystem can have great influence on its ecology, particularly if they are motivated by economic forces. Payments for Ecosystem Services (PES) programs may lead to improved environmental health by offering landowners economic incentives to use their land in ecologically sound ways. A recent study by Smithsonian Tropical Research Institute (STRI) scientists and collaborators evaluated the economic feasibility of PES programs within the Panama Canal Watershed (PCW). A multidisciplinary team of researchers assessed the costs and benefits of the Panama Canal Authority’s (PCA) offer of contracts to private farmers that encouraged them to reforest their lands. The researchers looked specifically at the impact of reforestation efforts on two features that enhance ship transits through the Panama Canal during dry months: increased dry-season water flow and reduced sedimentation in Gatun Lake, the main lake feeding the canal. They also determined a market clearing equilibrium for this type of program in the PCW: the point at which supply and demand of ecosystem services reaches perfect balance. This was calculated using real world data –a unique feature of the study– from surveys of more than 700 landowners throughout the watershed. Previous economic research on PES programs relied heavily on assumptions. “Our research shows that there are market equilibriums or limits to these programs, and that reforestation to increase dry-season water flow and reduce sedimentation only makes sense in certain areas. According to our analysis, the Panama Canal Authority is applying PES in exactly the right areas,” said Jefferson Hall, forest ecologist at STRI. The team was able to identify differences between sub-watersheds, with the eastern part of the PCW providing greater hydrological services than the western part. Ultimately, this research helps advance the economic science of PES work, providing a mechanism for analyzing the scale of these programs and comparing benefits and costs, an aspect most PES assessments have set aside. 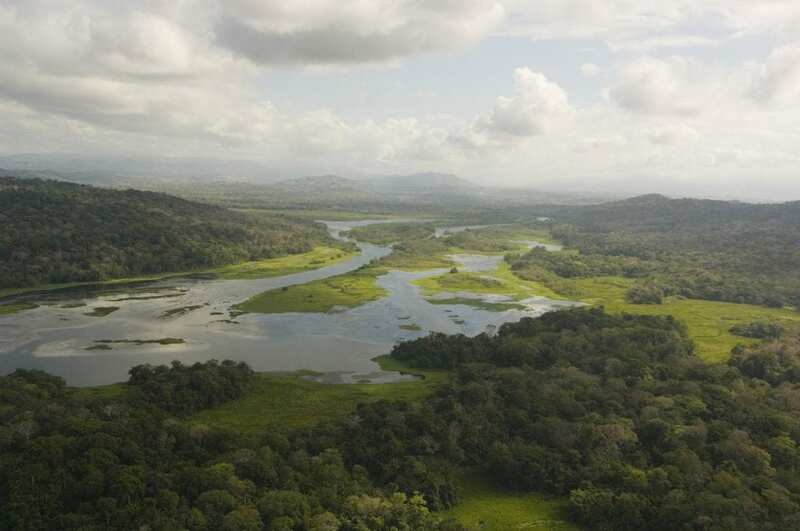 The team of scientists also looked at the importance of forested national parks, such as the Chagres National Park, in upland areas of the basin. They suggested that reforesting 10,000 hectares of land within the park would have a greater impact in terms of ecosystem services than reforesting all the privately owned land eligible for a PES program. These calculations did not consider park protection costs. “There are a variety of reasons agroforestry could be important in this watershed, such as enhanced livelihoods, biodiversity, carbon sequestration or flood mitigation. This manuscript only looked at two of these,” said Hall. Members of the research team are affiliated with STRI, the Department of Resource Economics and Environmental Sociology at the University of Alberta, the School of Forestry and Environmental Studies at Yale University, the Department of Agricultural and Resource Economics and Global Institute for Water Security at the University of Saskatchewan, the Department of Civil and Architectural Engineering and the Haub School of Environment and Natural Resources at the University of Wyoming and the Water Mission Area of the U.S. Geological Survey. Research was funded by grants from the U.S. National Science Foundation’s Water, Sustainability and Climate Program, the Smithsonian Tropical Research Institute, the Weyerhaeuser Memorial Fund, the Silicon Valley Foundation, Stanley Motta and the Hoch Family.